Body Sugaring is an ancient method of hair removal that can extract hair that is 1/16th inch long when the skin is in optimal condition. Hair is removed in the early stage of growth so the hair grows in finer each time and can lead to permanency. The sugaring paste is made from natural ingredients and leaves the skin silky and smooth. It is, by far, my favorite method of hair removal! Your skin may look pink and feel hot and itchy immediately after a treatment. This is due to excessive blood flow to the area treated. This reaction is normal and should disappear within an hour. Avoid direct heat such as hot baths, sun-beds or sun-bathing. Do not rub or scratch the skin. Avoid wearing tight-fitting clothing immediately after a treatment. Do not exercise immediately after a treatment. Do not exfoliate the area treated the day before, day of or day after a treatment. finipil is now available as a finishing treatment after your service is complete. finipil is an FDA registered over the counter antiseptic that kills germs, reduces redness and swelling. 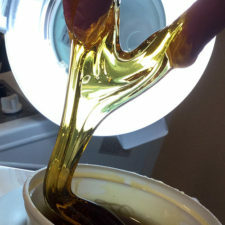 It closes the empty follicle and kills germs to protect the follicle after a sugaring treatment so that you may return to your regular routine. Exfoliate the area to be Sugared everyday with exfoliation gloves except for the day before, day of, or day after your treatment. Exfoliating the area will help to prevent ingrown hair. Hydrate the skin everyday for better Sugaring results. This will also help to prevent ingrown hair. Do not use razors or depilatory creams between treatments. Doing so will interfere with your goal to diminish your hair growth. Epilfree is a revolutionary Permanent Hair Reduction Solution that works in conjunction with a regular sugaring routine and is applied after hair removal. The results are equal to laser but without the limitations. It is suitable for all hair types, all skin types, and is safe for tattoos. Results vary from individual to individual depending on external and internal factors. Consistency is important and treatment every 4-6 weeks with a minimum of 12 treatments is recommended for best results. If you would like more information, please call or text. Please come to your appointment with clean skin – no oils, powders, lotions, deodorant, perfume or make-up on the area to be treated. Aftercare is also important. Do not shower, bathe, or participate in activities that cause sweating for 6 hours. Come in for treatment every 4-6 weeks. Avoid direct sun exposure before and after treatment. Pricing includes sugaring hair removal and Epilfree. I have never really been fond of soft or hard wax. I searched for quite a while for a hair removal product that is resin and polymer free and didn’t leave the skin feeling sticky afterward. It took a while and then I discovered Nufree. It is a soy based botanical product that was created for plastic surgeons to remove hair prior to surgery. It is applied the same way soft wax is applied and removed with paper strips. finipil is applied after the Nufree hair removal service. It’s cooling and antiseptic properties kill germs and close the empty follicle so that you can go back to your regular routine. finipil is a scientifically approved, patented, FDA registered OTC antiseptic made by Equibal Labs which is applied on clients after and in between Nufree hair removal services. This antiseptic cream destroys 99.999% of bacteria and cools and soothes the skin while protecting the empty hair follicle. finipil cools – by dropping the temperature of the empty follicle, freezing away swelling due to water retention, hot showers or aerobic workouts. finipil should be used daily – on damp skin after showering or bathing to activate it. This keeps the skin sanitary and the follicles clean and free of clogging and foreign matter. finipil protects against ingrowns – and rids the area of old ingrowns caused by waxing, shaving at home, and hard water.